Entries from Digital Intelligence tagged with "hong kong"
Twitter plans to open offices in Hong Kong next year, as the social looks to rival the likes of Weibo in the hugely lucrative Chinese market. Pro-democracy protestors in Hong Kong are using FireChat to keep in touch and bypass an internet and network lockdown in the country. Japan has the highest number of online videos watched per user with 242.5, surpassing its closest contender Hong Kong by over 60 videos per user. 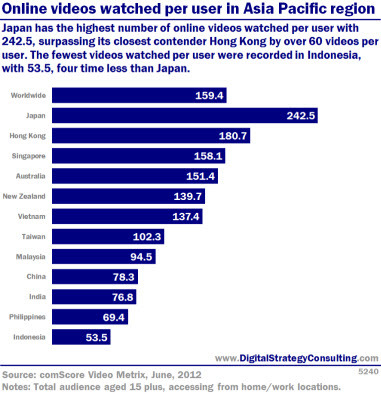 The fewest videos watched per user were recorded in Indonesia with 53.5, four times less than Japan. This chart shows the total number of unique online video viewers and the percentage of that countries web population that they represent. Vietnam and Hong Kong have the highest percentage of their web population engaging with online video with 89.8% and 88.7% respectively. India and Indonesia showed the lowest total percentage of web populations interacting with online video. 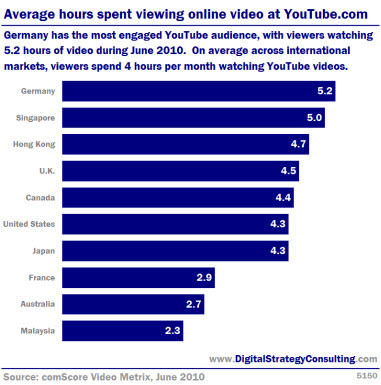 Germany has the most engaged YouTube audience, with viewers watching 5.2 hours of video in June 2010. On average across international markets, viewers spend 4 hours per month watching YouTube videos. Google is to stop automatically redirecting users of its Google.cn site to its Hong Kong page, in a bid to secure renewal of the company's China service license. The move comes after the Chinese government said the company would lose its mainland Internet license, which expires Wednesday, if the tactic continued. Chief legal officer David Drummond said in a blog posting that Google had already started taking a small percentage of users to a landing page on Google.cn that links to Google.com.hk, and would soon stop all redirecting.